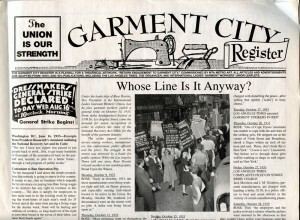 return engagement to garment city was a traveling performance on the Los Angeles MTA system based on the 1930/40’s organizational movement of the International Ladies Garment Workers Union (ILGWU) as led by its Vice President Rose Pesotta. Rose, an immigrant garment worker herself, successfully organized several significant ILGWU strikes and protests with thousands of LA workers. Her autobiography, Bread Upon the Waters, with its wit and honesty about the union politics and a day’s labor, and her high fashion picket lines, sparked the idea for a performance. Upon interviewing local retired garment workers who worked during that period, the artist developed script and libretto. Film footage of worker conditions, organizing techniques and pickets lines in Los Angeles and the idea of worker’s muscle memory inspired the choreography. Music compositions stem from a combination of factory sounds, union mandolin orchestras and period pop and folk music. The performance happened in a series of short acts. Rush hour passengers gradually accumulated the full narrative as the play occurred three times a week between 5-7 pm for the month of February in 2001 at the 7th Street Metro Station and on metro blue line subway cars. A mock 1930s newspaper combined period advertising, relevant 1940s articles, industry illustrations and jokes, with the playbill.